One of the articles you authored a while ago caught my attention and I am hoping to discuss with you publishing a followup article, or even a review article in the Internal Medicine Review. 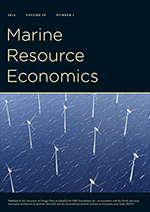 The article was entitled "A revealed preference approach to valuing non-market recreational fishing losses from the Deepwater Horizon oil spill.". I am sure our readers would find an article that continues this work valuable. The parameters of the article are flexible and I am happy to help in any way I can. Would you or perhaps one of your students have time to contribute an article over the summer? Those parameters must be REALLY flexible. *Yes, that was my actual response. "How does a Nobel-prize-winning economist become a victim of bog-standard selection bias?" Again, I’m not saying that Heckman and his colleagues are doing this. I can only assume they’re reporting what, to them, are their best estimates. Unfortunately these methods are biased. But a lot of people with classical statistics and econometrics training don’t realize this: they thing regression coefficients are unbiased estimates, but nobody ever told them that the biases can be huge when there is selection for statistical significance. And, remember, selection for statistical significance is not just about the “file drawer” and it’s not just about “p-hacking.” It’s about researcher degrees of freedom and forking paths that researchers themselves don’t always realize until they try to replicate their own studies. I don’t think Heckman and his colleagues have dozens of unpublished papers hiding in their file drawers, and I don’t think they’re running their data through dozens of specifications until they find statistical significance. So it’s not the file drawer and it’s not p-hacking as is often understood. But these researchers do have nearly unlimited degrees of freedom in their data coding and analysis, they do interpret “non-significant” differences as null and “significant” differences at face value, they have forking paths all over the place, and their estimates of magnitudes of effects are biased in the positive direction. It’s kinda funny but also kinda sad, that there’s so much concern for rigor in the design of these studies and in the statistical estimators used in the analysis, but lots of messiness in between, lots of motivation on the part of the researchers to find success after success after success, and lots of motivation for scholarly journals and the news media to publicize the results uncritically. These motivations are not universal—there’s clearly a role in the ecosystem for critics within academia, the news media, and in the policy community—but I think there are enough incentives for success within Heckman’s world to keep him and his colleagues from seeing what’s going wrong. Again, it’s not easy—it took the field of social psychology about a decade to get a handle on the problem, and some are still struggling. So I’m not slamming Heckman and his colleagues. I think they can and will do better. It’s just interesting, when considering the mistakes that accomplished people make, to ask, How did this happen? Thinking about this in my small world, searching for that one willingness to pay (WTP) estimate that delivers statistical significance that favors your hypothesis is the equivalent of p-hacking. The state-of-the-art, NOAA-Panel-endorsed referendum vote question can be quite sensitive to the nonparametric or parametric estimator chosen to summarize the votes into WTP. This is especially true when the data are "difficult" (Haab and McConnell). When a WTP estimate varies by factors of 3 or 4 depending on whether a nonparametric or parametric WTP estimate is employed then researchers should interpret significance tests conducted with these data very carefully (if not reject them outright). I've become very worried that there is "lots of motivation for scholarly journals ... to publicize the results uncritically." Researchers who have "difficult" CVM data need to present the full range of WTP estimates. California lawmakers voted Monday evening to extend the state’s premiere program on climate change, a victory for Gov. Jerry Brown that included unprecedented Republican support for fighting global warming. The legislation would keep the 5-year-old program operating until 2030, providing a key tool for meeting the state’s ambitious goal for slashing emissions. Cap and trade also generates important revenue for building the bullet train from Los Angeles to San Francisco, another priority for the governor. California’s program is the only one of its kind in the U.S. and has been considered an international model for using financial pressure to prod industry to reduce emissions. Bipartisan support for the system comes as Republicans in Washington, including President Trump, have blocked, resisted or undermined national efforts to fight global warming. [CHRIS WALLACE, FOX NEWS ANCHOR]: Let me ask you one -- let me ask you one's last question, and again I apologize, sir. Because it goes to the whole question of commitment to trying to improve the environment. Under the president's new budget, the EPA is cut 31 percent, that is more than any other agency. And I want to put up some of the cuts that are included in the president's budget. Here are some of the 56 programs that would be scrapped: Great Lakes restoration, water runoff control for farmers, pesticide safety. What does that say about the commitment of this administration and you to cleaning up the environment when you're making a 31 percent cut in your agency and cutting things like that, water runoffs for farmers? In other words, Scott Pruitt's definition of "very positive environmental agenda" is different than what many environmental economics would consider a positive environmental agenda (i.e., pursue environmental regulations when the benefits exceed the costs ... this administration only considers the costs). For example, I might bristle at the term "father." "What does it even mean? I'm not (all that) fat. I'm not a her. Really? Wow, OK. That's crazy, in my view." Any my kids would be annoyed and embarrassed. Scott Pruitt says this sort of ridiculous stuff in a serious interview where he is representing the USEPA. EPA Administrator Scott Pruitt dismissed European critics of President Donald Trump's climate policies as hypocrites on Wednesday, while chastising German Chancellor Angela Merkel for phasing out her country's nuclear power plants. Scott Pruitt seems not to care and/or understand what he is talking about. Canadian economist and former* frequent visitor to Env-Econ, Mike Moffatt, posted this interesting picture to his Facebook page. Mike is center in front of the flag--glory hog. The interesting part is Canadian Prime Minister Justin Trudeau two seats to his left--sitting at a seat with the wrong name tag for some reason. I wonder if the President of the U.S. would drop in on a panel and take a seat in front of a different name tag. Just wondering. *I have no idea if he still visits or not. If he comments here I will remove the former tag. If he gets Trudeau to comment I'll give him a virtual hug.